We all know eating a healthful diet is good for our bodies. To make healthy decisions, we first have to be able to understand what nutrients contribute to a healthy diet, and second, know which foods contain those nutrients. For the former, the Dietary Guidelines offer a detailed table to help determine typical daily calorie needs. 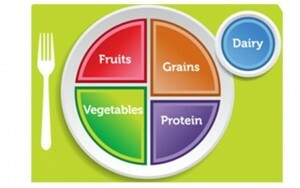 More specifically, you can estimate your caloric needs through MyPlate portal (ChooseMyPlate.gov). For the latter, aside from eating fresh fruits and vegetables, nutrients are broken down and listed on food labels — a required component of nearly all packaged foods. Here’s some tips on how to navigate daily nutrients and read a food label. So what does this mean? If you’re a 35 year-old moderately active women, consuming roughly 2,000 calories per day, your diet should consist of 45-65% carbohydrates, 10–35% protein, and 20—35% fat. Here’s how to determine how many grams of carbs, protein and fat you should be eating each day to maintain weight. Remember, these are estimates. You can play with the total number of calories and percentage of nutrients to find what works best for you. On the higher end of fat intake, 35% of daily calories coming from fat is 77 grams. If your goal is weight loss, an overall caloric deficit is needed from this 2,000 calorie daily budget. That deficit could be created by expending extra energy (exericse), or by reducing caloric intake, or both. If you are breastfeeding, your caloric intake would be higher depending on how much milk you produce. If you are reducing calories and your milk supply decreases, that’s a good sign your caloric intake and/or fluid intake is too low. Start with the serving information at the top of the label. This will tell you the size of a single serving and the total number of servings per container (package). In this example, 2/3 cup is one serving. Measure out 2/3 cup so you can visual what a serving looks like. This will help you eye-ball serving sizes in the future. Next, check total calories per serving. Pay attention to the calories per serving and how many servings you’re really consuming if you eat the whole package. If you double the servings you eat, you double the calories and nutrients. 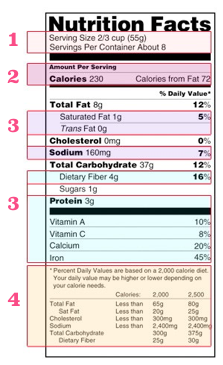 The next section of information on a nutrition label is about the amounts of specific nutrients in the product. The calories (230) per serving are then broken down into grams to give Total fat, Total Carbohydrates, and Protein. Based on a 2,000 calorie diet, limit saturated fat to no more than 11-13 grams, as little trans fat as possible, and no more than 1,500 mg of sodium. The % Daily Value (DV) tells you the percentage of each nutrient in a single serving, in terms of the daily recommended amount. As a guide, if you want to consume less of a nutrient (such as saturated fat or sodium), choose foods with a lower % DV — 5 percent or less. If you want to consume more of a nutrient (such as fiber), seek foods with a higher % DV — 20 percent or more. Now add up the calories from carbs (148), protein (12) & fat (72), it will equal the total calories (230) in serving. Bare in mind, Nutrition Fact labels can have a 20% margin of error. If your goal is weight loss, always overestimate number of calories consumed, and underestimate number of calories expended. 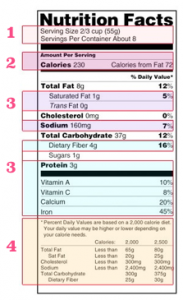 Remember that the information shown in Nutrition Facts food label panels are based on 2,000 calories a day. You may need to consume less or more than 2,000 calories depending upon your age, gender, activity level, and whether you’re trying to lose, gain or maintain your weight. 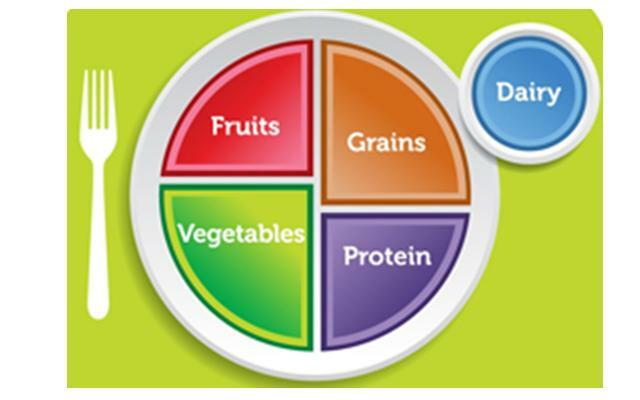 Visit ChooseMyPlate.org, or Supertracker.usda.gov for online tools and how-to-strategies for better eating; and dietaryguidelines.gov for more complete nutrition recommendations.